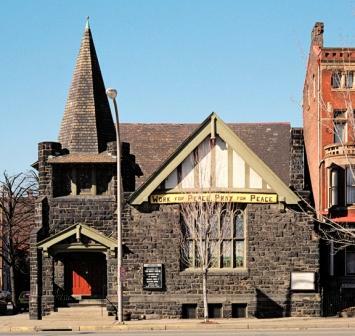 What is special about Allegheny Unitarian Universalist Church? You’ll find amazing people here from diverse religious backgrounds and on varied spiritual paths. Our preacher gives great sermons, and we have worship music that raises the roof. We are small, and friendly, and welcoming to all. We’re old, around since 1906. And we’re young, with more 4- and 5-year olds than you can shake a stick at, with a booming program for kids. We’re central, about as close to downtown as you can get. Our front door opens to the most bucolic city park any city dweller could imagine, complete with a lake. As an urban church, we are part of an always in transition neighborhood where many around us need a helping hand. Just down the street the largest homeless population in the city gathers daily for free meals. A few blocks away, the largest food pantry in Allegheny County serves 1000 food-deprived families each week. New York City brownstone-looking houses on our block sell for 400k, while rundown houses a few blocks away sell for 10k. Our presence here defines us, we are of this neighborhood, and work to address its most pressing issues. We remain here to change lives, and to save lives. As mainline churches face drastic declines in religious participation, Unitarian Universalism is stable and by some measures growing. Why? As Unitarian Universalist Association President Peter Morales says, we are “a religion for our times”. Our liberal religion values diversity, inclusivity, and truth, and our progressive social positions drive social advocacy and action, community-building, and stewardship of the planet. We are hopeful and optimistic. We put our faith into action by celebrating life, nourishing the spirit, and inspiring a commitment to justice. We invite you to come visit and experience this extraordinary congregation and community!